Center for Astrophysics and Space Sciences Seminar on TMT, at UC San Diego on 16 January 2019. Ravinder Bhatia and Brian Keating to discuss TMT Project and science in many areas of Astronomy - Photo by Stuart W. Volkow, UCSD Cosmology Group. Last week, Dr. Ravinder Bhatia, our Associate Project Manager, visited the Center for Astrophysics & Space Sciences (CASS) at the University of California, San Diego (UCSD). In Ravinder's astrophysics seminar, he presented an overview and status update of the TMT Project. Among the main topics of discussion were the science cases for the TMT, its first light and second generation science instruments, and the construction site for TMT. Also discussed was the new US-Extremely Large Telescope initiative, to provide the broad US astronomy community with observational access to both the northern hemisphere (with TMT) and the southern hemisphere (with GMT), and for which funding is currently being sought. Ravinder was co-hosted by Professor Brian Keating, who was a Postdoctoral Scholar along with Ravinder many years ago at Caltech, and is now Director of the Simons Observatory. Dr. Brian Keating is also Professor of Physics at CASS, UCSD. Professor Brian Keating (CASS) and Andrew Bazarko, Project Manager of the Simons Observatory attended the talk and joined the discussion on TMT international project. The Simons Observatory is a future astronomy facility to be built in the Chilean Altiplano to observe the cosmic microwave background. 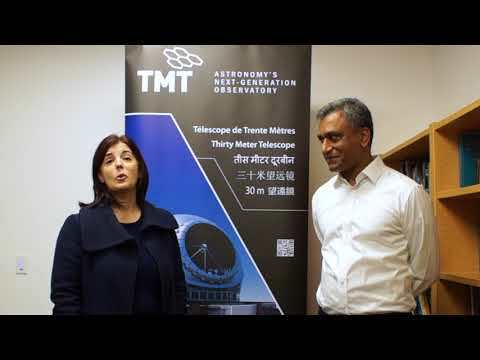 Ravinder was also co-hosted by Professor Shelley Wright, who is the Project Scientist for TMT's InfraRed Imaging Spectrograph (IRIS), and also working on the Search for Extraterrestrial Intelligence. Professor Shelley Wright and Dr. Jérôme Maire (Assistant Project Scientist) at the CASS Optical and InfraRed Laboratory, with prototype hardware for the IRIS development program.